And so our plan is pretty loose. We’ll spend about three weeks here but will have to keep on the move as we plan on seeing the country from the top all the way to the bottom. Apparently there is a train system that runs most of the way…I love traveling by train!! Ha Noi will be our gateway into Vietnam. We’ll hang out here for a few days, seeing the sights, maybe taking in a water puppet show and arranging passage to the famous Halong Bay. Almost 2000 limestone islands jut out of the water of Halong Bay. It is a mystical looking place where square sailed ‘Junk’ boats offer tours of the bay to better explore the caves and grottoes that are carved into the cliffs of the islands. I’ve heard that the islands of Thailands southern coast give Halong Bay a run for their money – we’ll have to see what we think. Cat Ba Island and National Park with its limestone mountains, tropical rainforests, coral reefs, caves and beaches, is great gateway into exploring Halong Bay. There is plenty of hiking and exploring to be done on the island – the scenery here is stunning and like nothing that we know here on the west coast of Canada. From there we’ll head south with Hue being the next city destination. It might be nice, though, to head inland a bit and catch the Cuc Phuong National Park to see its 1000 year old trees and endangered wildlife. We’ll travel through the Demilitarized Zone (DMZ) to get to Hue. Here we will learn about the Vietnam War through the eyes of the Vietnamese, who call it the American War. We’ll have a chance to see some former military bases and will also visit the Vinh Moc Tunnels where large numbers of Vietnamese families survived during the conflict. It will be interesting to say the least and I know that I will learn a lot. Hue is a colonial city and it’s food is said to be the best in the whole country. We will spend a number of days here making sure we sample all that we can. A bike tour may be the best way to see all the architecture of the city – and it will help us work up an appetite for all that yummy food! Hoi An (yes, many of the city names sound very similar to each other – we’ll have to be careful when booking transportation that we know where we are, and where we want to go!) is another UNESCO World Heritage site to visit. Preserved sites here date back to the 16th and 17th centuries – now that’s history! Hoi An is also known for tailoring. Vietnam, and Hoi An in particular, is a great place to get clothes hand made and tailored especially for you, although I don’t know how much use we’ll have for a silk suit. 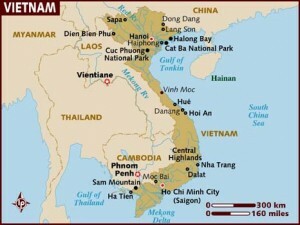 Ho Chi Minh City is the next large city to visit. We’ll visit all the major sites and take some day trips out to the surrounding areas before continuing south to see the Mekong Delta with its villages, canals and markets. Then it’s back to HCMC to fly out to Bali. I’m looking forward to traveling in Vietnam. Although our itinerary is loose now, we have plenty of time to firm it up before we’re there next year. ← You’re Crazy…No YOU’RE Crazy…Get Out Of My Head!! Are you going to try and make it to Sapa from Hanoi? Lots of small villages out there to do some trekking in. My friend recently did it and said to not bother with a tour package as it is very easily to get around yourself. Your Vietnam itinerary is the same as mine [minus Sapa] so I look forward to seeing how it goes for you! @Jeremy: I have heard that Sapa is not to be missed. A friend told me recently to head to Sapa and skip Halong Bay! @Michelle: Of course we will be able to fit you in! It would be fabulous to connect up with you guys before we leave. Drop us an email or call J on his cel. wow, I can’t believe that you’re leaving so soon!??! you must be so excited! we’re gonna be on the Island likely the week before you leave, will you be able to fit us in?? i hate vietnam but impartally, its beautiful. Hoi An was my favorite place and I suggest staying there for awhile. It was beautiful and had great food. The delta region is good too. If you can get to Sapa and cuc phon national park near Hanoi. Anything with wilderness in vietnam is the best. Your trip is coming up fast. I am both terribly excited for you and jealous. I can’t believe that it is almost time for you to leave. Just like I can’t believe it is almost time for us to leave also. As of this moment, I do not think our travels will take us to south Asia, but never say never. I have very shyly took some paper off the windows of my site and those who have been following your blog for some time may remember that you had alluded to others who had plans in the works. So, I am coming out, slowly. Found your site through my friend Liz of where are liz and adrian. I went to Vietnam in October and while I didn’t go to Sapa I did go to Halong Bay and highly recommend it. There are a number of cheaper tours you can take and only do one night, apparently two aren’t worth it. I did the train from Saigon to Hanoi (robbed my first day in Saigon and passport was in bag – which is another story all together) and we stopped in Nha Trang to scuba dive. The train is great but long (Nha Trang to Hanoi was 25 hours) and apparently flights are just as cheap, look up Air Asia which is a luxury discount airline which I think may be run by Virgin Airlines. I loved Vietnam – beautiful people, amazing food and so inexpensive. Definitely visit Sapa and if you can swing it head to the Bac Ha market near the Chinese border! It’s best early in the morning before the tour buses head in. It’s not about what you can buy there, it’s seeing the people in action! Just starting to plan our 6-month around the world trip (starting in Jan 2010)….your detailed budget is great, thanks! train from Hanoi to SaPa in the mountains. Go trekking. Beuatiful area. from Hanoi to Halong Bay- stay on a dragon boat for several days, and go kayaking thru all the great caves! Hoi Anh- we loved it so much here we skipped Hue to stay longer. Lots of day trip options, took a cooking class, etc. Saigon- crazy busy city! and expensive by Vietnam standards. I didn’t love it, but glad we made it a stop. we spent 3 days here. 3 days is enough in my opinion. Mekong Delta- we did a 3-day bike tour. was very memorable but very HOT!!! and wet. and muddy. Phu Quoc Island- we did absolutely nothing for 4 days, sat on the beach, ate great meals, stayed in a thatched hut.